Challenges - 100+, A to Z Authors, New Author and Library. I ordered this book from the library, after hearing many American bloggers talk about how wonderful this book had been and how it was a well remembered and loved book from their childhood. Now I am always interested in reading books from my childhood, so I thought it would be nice to explore the popular children's books from other countries. So with this in mind I dived into this book full of excitement and I have to say it didn't let me down. Island of Blue Dolphins is about a young Indian girl called Karana, who has lived on the island all of her life with her family and the rest of the tribe. When she reaches the age of twelve, a ship full of Russians come to the island to kill otters for food and their skins. A deal was struck between the Russians and the Indians, which allowed the Russians to hunt. Unfortunately, nearing their return to their boat, the Russians did not keep to their part of the deal and many lives were lost. This brought unhappiness and despair to the island and when the Indians were given the chance to leave the island they took it and left by boat. All except Karana, who ended up being left behind. For many years Karana lived on the island by herself and she learnt to provide for herself and made friends with the wildlife that lived around her. She had some tough times, but she pulled through and many years later she was rescued from the island. There is a lot more I could tell you, but I don't want to spoil the story for you. I thought it was a beautiful, poignant story. I wasn't expecting the events in it to make me cry, but they did! It was quite an emotional story and I wished I had been warned about that. The story is well written and the descriptions are very visual. I could almost imagine myself on the island. I really think this is a book that should be put on our curriculum for older children to read. Any of my teacher friends reading this, I would definitely recommend it for Year 5 and Year 6. A lovely story from across the continent. When I got to the end of the book, I was surprised to read that it was based on a true historical story. In the 1800's a woman was discovered living on an island on her own and she had been there for nearly 20 years. She was known as the Lost Woman of San Nicolas. Here is a link to the story of The Lost Woman,so if you wish to read the book, you can compare the story to the reality. The author Scott O' Dell, was a well loved author amongst the children of America in the 60's and the 70's. 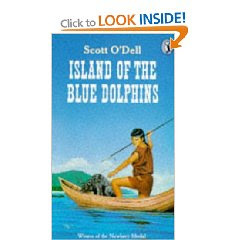 Island of the Blue Dolphins which was released in 1960, launched Scott in his career in writing. He went on to write another 25 books for his younger audience. Twenty years after his death in 1989, his books are still well loved by children across the country. I find it amazing that such a fantastic author is not so well known over here in England.I would have loved to read his books when I was a child. I will definitely read more of his books. Thank you to all the American and Canadian bloggers who recommended this book to me, I really loved it. Also do let me know if there are any others that you think we may not have read over here, that we would love. I'm so glad you liked this book! It was one of my favorites growing up. I read this book again when I was pregnant (with my first, I think) and I found it just as interesting and entertaining as when I was a child. I'm having a hard time remembering other books that I loved as a child.. I never read this book when I was young but I'm going to see if my library has it. I've been thinking of looking back at books from way back and see if they are as enjoyable as they once were to me. sounds interesting, I think when a book can make you cry, thats a good thing.